Anthony DeMartino was Lawndale High's teacher of History. He has a trademark habit of shouting every 4th or 5th word that he spoke, whereupon his right eye would bulge dangerously. Mr. DeMartino's perpetual state of rage was one of the many examples of extreme character humor the show had to offer, and he was also a fan favorite. 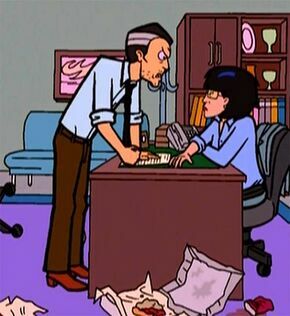 According to The Daria Diaries, he was 48 years old at the start of the show (and presumably was 51 at the end). A normal day ("The Daria Database"). From the very beginning of the show, he is shown as having become very disillusioned with his role as an educator. 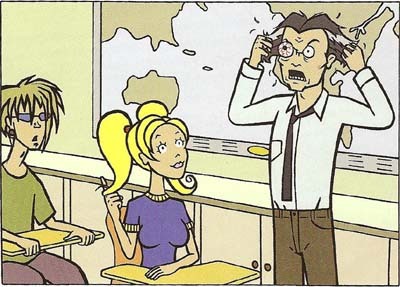 One of the show's running gags was Mr. DeMartino's bitterness over his low salary and disgust at the incompetence of several of his students, particularly Brittany Taylor and Kevin Thompson, who never seemed to make any effort to succeed in his class, and, if their classroom performance was any indication of their abilities, may have been educationally incompetent to the point of functional illiteracy and therefore thoroughly unteachable in a conventional classroom setting. In "The Daria Hunter" and "Fair Enough", where he has a chance to cause suffering and pain to some students and get away with it (paintballing and in a jousting game respectively), he gleefully takes it. Principal Li has a standing order that DeMartino is to be no longer request retirement during classes. In "Is It Fall Yet? ", in his lowest hour, he broke down at the idea that he was just "no good at working with young people". While frustrated with his life to an almost maniac state, Mr. DeMartino is shown at points to enjoy teaching some students. 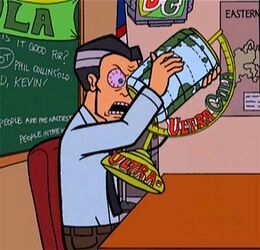 This is highlighted by his frequent almost-friendly tolerance for Daria Morgendorffer on occasion, as well as for her sister Quinn Morgendorffer on those few occasions when she shows some depth or displays some of her true academic prowess and potential. Helen Morgendorffer appears to view him as the only competent teacher at the school, turning him to get information in "The Lawndale File" as "he's a bit high-strung but he's a fixture at that school". In "Antisocial Climbers", while grumbling about it, he went out on his own in a blizzard to find help for the trapped students. He was the head of the teacher's union at Lawndale and had led a failed strike once before. In "Lucky Strike", he took the faculty on strike once again and led them to victory through sheer force of will and threats to Li that he would picket naked. Mr. DeMartino's only friend, either by choice or not, appears to be Timothy O'Neill, another teacher at Lawndale High. Due to Timothy's laid back, all accepting personality, and his regular lack of abrasive and rough characteristics, it is thought by some that, despite Anthony's general irritation with Timothy, the friendship is a soothing one for him. He is often seen venting his frustration at Timothy who always listens and may actually be genuinely concerned at times, despite his inability to help in the slightest with any of Mr. DeMartino's problems (even those he is himself responsible for). 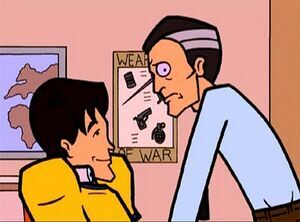 By the end of the series, specifically in the Daria movie, Anthony is treating Timothy like a friend, by going out of the way to prevent him from making decisions he will later regret or letting Timothy's personality be pushed around by more assertive ones. Anthony fights for workers rights in "Lucky Strike". To some extent, the student body at large are an enemy. Based on everyone taking bets on whether he'd die in "The Big House", he's not very popular with them. Sports players in particular have earned his ire, and in "The New Kid" he gleefully leaps at the chance to cut some yearbook pages from them. His three great nemeses in the series are Kevin Thompson, Principal Li, and Janet Barch. Of these, Kevin is the most frequently seen. The sheer unceasing incompetence of Kevin, to the extent he can't even tell when DeMartino is insulting him, is a source of intense rage for the man - though despite that, he always keeps choosing Kevin to answer questions. There's no malicious intent towards DeMartino from Kevin's part though, as he always acts cheery and friendly to the teacher. Barch, on the other hand, has it in for DeMartino: in "The Daria Hunter", she targeted him to take out her anger over her ex-husband; "The New Kid", "The Daria Database", and "Is It College Yet?" all see her physically assault him to get her own way; and in "The Lawndale File" she falsely reports him as an illegal immigrant to get him deported. Why she has it in for him is unknown. Outside of trying to save O'Neill from marrying her in IICY?, he avoids interacting with her. The beloved Uncle Anthony, in "Is It Fall Yet?" Mr. DeMartino has a seething hatred for most of the student body at Lawndale High, because the majority of them are either lazy, slackers, or absurdly stupid. All of these characteristics in turn make his job less fulfilling and lead to outbursts of rage; everyone seems used to this by now and barely respond, outside of Daria and Jane snarking, though Jane once joked that he caused students to wet the bed ("The Big House"). Students that are usually well behaved, such as Jane Lane and Jodie Landon, don't arouse his ire. Despite his uncontrolled rage, Mr. DeMartino's has never been violent to any student - with the exception of Kevin, who he once started strangling ("Murder, She Snored"), and that led to a brief stay at Brookside Rest Home and some medication. Kevin's near mythic levels of idiocy and stupidity constantly frustrate Mr. DeMartino's efforts to teach, as Kevin appears incapable of learning practically anything beyond a football play. Students such as Daria, that are not only capable of learning but quite willing to do so, do not frustrate him. Mr. DeMartino at times seems pleased with their academic work, even if they are not the brightest but have merely tried hard, such as the case of Quinn on occasion; he also has remarked semi-favourably when Brittany actually manages to understand a question and give the right answer. After attempting to get a correct answer of an imbecile of his class, usually Kevin, he then calls on such students who readily provide the answer he was searching for. These students are rarely, if ever, the targets of his direct tirades and only suffer his classroom discipline when the class as a whole is being punished. In the case of Daria specifically, he first found her answers "suspiciously good" and barked at her to "stop showing off!". As time went on, he grew more in her favour, once remarking in "The Daria Hunter" that "your sarcasm amuses me, Daria" and, in "Just Add Water", telling her that she made him "want to kill myself a little less" than the rest of her class. In "Antisocial Climbers", he aoppreciated and swiftly agreed to Daria and Jane's offer to assist him, and attempted to keep them safe in a group. During her graduation, when she received an award for academic achievement, DeMartino cheered her on with "very good, Daria! You go, girlfriend!". What students think of DeMartino was shown in "The Big House": very little, since they were taking bets on when he'd suffer a major injury in a hockey game. Whether they have it in for DeMartino specifically or if any near-death would satisfy is unknown. In general, nobody seems too bothered by him. Kevin and Brittany, of all people, are always cheery to DeMartino and seems incapable of noticing when DeMartino is ranting at or insulting them. Daria and Jane respond to DeMartino's antics with a constant barrage of amused snark, of course. He went through a "beatnik period" at some point, where he co-habited ("The Daria Diaries"). When this happened is unclear: DeMartino would've left military school in the late 1960s, by which time the Beat Generation had changed into the 'hippie' counterculture, so he'd have been looking back to a previous movement rather than getting involved with the newer one. He has a preexisting gambling addiction (per "Just Add Water," when DeMartino first asks Ms. Li if he can get out of going to the casino night cruise, and then when he freaks out when he steps into the casino on the cruise). He smokes cigarettes and (sometimes) exercises (per "The Big House"). He speaks with a thick New York accent. His appearance and speech are modeled on actor Christopher Walken (due to the one blue eye). "Hey, Mr D, we're the same person!" Anthony DeMartino was voiced by actor Marc Thompson, who also gave voice to Timothy O'Neill, Kevin Thompson and Charles "Upchuck" Ruttheimer III. In the Latin American dubbing, he was voiced by Gabriel Chávez. DeMartino routinely appears in fanfiction as a supporting character, his vocal tic either represented through italicised or bold words or by RANDOMly capitALISED words - or a combination of all three. 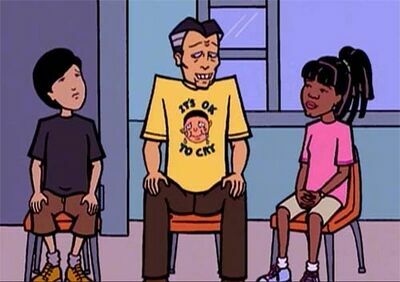 He is often shown as one of the better teachers at Lawndale and an ally of Daria. Several fanfics have, based on his age, military school background, and comments that "a lot of good men died [in Vietnam]" in his first appearence, made him a Vietnam War veteran. When he is given a romantic pairing, a number of fics have paired him with Claire Defoe even though they had no significant interaction in canon, outside of him taking her wind chimes and throwing them in the bin in "Daria Database" ("he just couldn't take them anymore"). This page was last edited on 7 January 2019, at 05:02.